Today, we are crushing on…. (drum-roll, nduulu)…Maureen Agena. She is a communications consultant and a citizen journalist who runs her own blog. She blogs about life, especially Agriculture and technology. She believes that policy is the greatest driver for change and for that reason has worked as a Consultant at ICT4D, and the Secretary General of the ICT Association of Uganda, ICTAU. Maureen is also a Founder and Director at Tune Communications, an establishment that is focused on providing innovative, cost effective and result oriented communications solutions to organisations in Uganda and around the region. In 2011, She was the East African award winner for ARDYIS. Maureen was also a recipient of the prestigious Commonwealth Scholarship to complete her Masters of Science in Information Systems in Nova Scotia Canada. 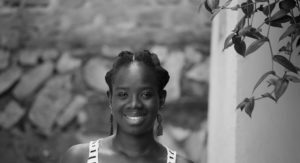 She is also a co-founder of Girl Geek Kampala, which has now turned into InnovateHerAfrica, an initiative aimed at bridging the gender digital divide by encouraging girls to excel in the tech arena. From this, it is easy to see that a lot of her work enables her look into quite a number of ICT related policy issues. With this much going on, you’d expect that to conduct this interview, we had to wait outside her Masters class. On the contrary, I met Maureen in an overall at a garage tinkering under the hood of a car as a soon-to-be-without-job mechanic looked on. We got to talking and this is how that conversation went. At what age did you start chasing your dreams, considering your accomplishments at such a young age? I would totally be dishonest to say that I remember exactly when I started to “Chase my dreams”. Growing up, I admired mechanics and thought I would eventually become one when I grew up. Fast-forward, I ended up in Information systems, and this gave me a whole new perspective to life. I now occasionally go for voluntary hands-on mechanical work in some garages around Kampala. I guess to try and experience my childhood dream. What challenges did you face starting out and which ones do you face now as a woman in IT? I was privileged to start out at a Women’s organisations that focused on Women in ICT. That taught me the practical angle of ICT for Women in the real world, away from ‘arm chair’ and boardroom ideas and solutions. My biggest challenge was with the stereotypes that exist among women regarding use and access to ICT. Also, there were deep-rooted gender issues of control and mobility when accessing technology. Both these, currently, do not work in favor of women and girls. I moved from the geeky kind of tech into what I do now; policy and mentoring others. I realised that everything revolves around policies without which so much is at stake. To have more girls in tech, we need favorable policies and also, we need to increase access and use of ICT among women. The list goes on and on. Through a company that I recently founded, Tune Communications, I intend to focus on the various policy issues in agriculture and health and a couple of other thematic areas that affect women the most. The challenge, as it has always been, is having few women in technology and retaining those who are already involved. What opportunities do you feel the girl child in Uganda has that have not been exploited? We are yet to harness the power that comes with the internet especially for those who have access to it. Its value is all-round; from educating oneself, to doing business, to getting scholarships, to being an author through blogging and so much more. How do you manage to balance your life? Time is inelastic; we all have 24 hours a day, and whatever we choose to do with that time is up to each one of us. I plan for my work ahead of time and I try as much as possible to stick to my plans. I also keep time when I have appointments so that I save more time for other things. I take stock of my activities and people in my circles and slowly eliminate those that don’t add so much value to my professional or personal life. What do you wish you knew back then that you know now? That you should never underestimate anyone, especially a young person because the difference between you and that person is TIME. Everyone has the power to create positive change in their life and community. No one is voiceless or powerless. Many only lack a platform and or privilege to amplify that power and voice. For those who have been privileged enough, it’s important to extend that hand of help and support to others through acts as small as mentorship, dialogue and communion to mention but a few. Are there any specific things you have done to keep growing, glowing and developing as an individual? If yes, what are they? I am extremely adventurous and I take time off to travel, interface with nature and explore as a way of rekindling my interest for work, appreciating cultures different from mine and the diversity of people. It has worked for me. I love and go for thrill activities like bungee jumping, rafting and the like. But most importantly, I exercise quite a lot. I practice yoga, go jogging, swim, and cycle. Also, I read at least a book or two a month on a wide range of issues. That’s all I managed to get before Maureen had to run off to go skydiving. I wasn’t fly enough so I sat that one out. Maybe next time, we’ll have an even longer conversation. Thanks a lot, Maureen.